A Watch Party In China For The U.S. Presidential Debate : It's All Politics Gathering voters to watch a presidential debate and then evaluate it is a long tradition in American journalism. So, I got to thinking: What would happen if I invited a bunch of interested foreigners — all of them Chinese citizens — to watch the presidential debate from my Shanghai office? Gathering voters to watch a presidential debate and then evaluate it is a long tradition in American journalism. So, I got to thinking: What would happen if I invited a bunch of interested foreigners — all of them Chinese citizens — to watch the presidential debate from my Shanghai office? We made invites over the Internet for the second debate between President Obama and Mitt Romney. We bought wine and beer — which practically nobody drank — set up computers and monitors, and streamed the debate in English (as I couldn't find a Chinese version) for an audience of eight white-collar professionals, ages 24 to 40. Because the debate took place Wednesday morning our time, when everyone was at work, we watched a replay of the debate that night. Like many Chinese, more than half the folks favored President Obama. Living in a nation with a giant income gap and a pronounced resentment of a privileged, connected elite, the Chinese related to Obama's populist tone. They also liked his less confrontational stance toward their country. While some admired Romney's business smarts, they thought his criticism of China was primarily driven by political calculus and overblown. For instance, when Romney vowed to label China a currency manipulator, Alex Shi, who works in manufacturing, thought the Republican was just blame-shifting. "Do not try to find any scapegoat," said Alex, who spoke great English. "Just try to put your own fiscal house in places. Try to look into your own problems." When Romney cited China for taking American manufacturing jobs and pledged to create a business-friendly environment that would encourage companies to bring jobs back to the U.S., the Chinese weren't buying. Stella Xie, who works for a Chinese economics magazine, said Romney seemed to be blaming China for a fact of globalization: low-wage, low-skilled jobs tend to migrate to low-wage countries. "In the past, the U.S. had these issues over manufacturing jobs with Japan and with other Asian countries," said Xie. "They have an argument with China at this point. Maybe 10 years later, they will have these issues with Vietnam and Cambodia as these jobs shift out from China to other countries." Some pressing U.S. domestic issues resonated with the audience here. When Romney lamented that 23 million Americans are struggling to find a job, the Chinese could relate. Although China has seen staggering growth over the past three decades, unemployment is a big problem here, in part because the ranks of educated workers are swelling. John said landing a job remains tough. Even the master's degree he received a few years ago didn't help much. "As a postgraduate student, it's hard to find a job," said John. 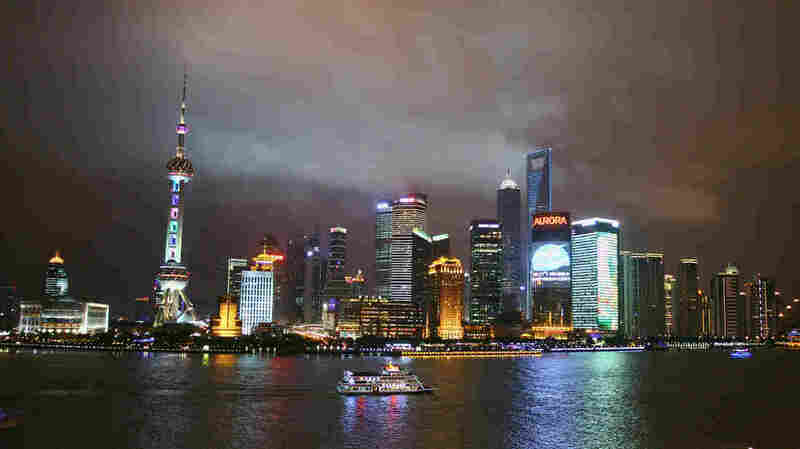 "Not only for America — employment is also an issue for China. It's not just Obama's problem or someone's problem. It is a problem the whole world faces." Stella Xie thought Romney's criticisms of China suggested he'd be harder for the Chinese government to work with. "I think it more reflects his ingrained mistrust of China," she said. "I think, for the future, if China and the U.S. want to grow their economies, there has to be trust." Others thought Romney's attacks were more campaign rhetoric. Andrew Liu, an accountant in the finance industry and a Romney supporter (not that any of these observers can actually vote, of course), thought Romney would take a more practical approach and try to enhance business with China once he got into the White House. "Traditionally, Republicans are focused on the economy and more pragmatic," he said. "When it comes to U.S.-China relations, they attach more importance to trade." In the end, everyone seemed to enjoy the debate. They especially liked seeing ordinary citizens in the town hall-style forum question the people who want to lead them about the most pressing issues of the day. It's something they all said they wished they could do here in China.